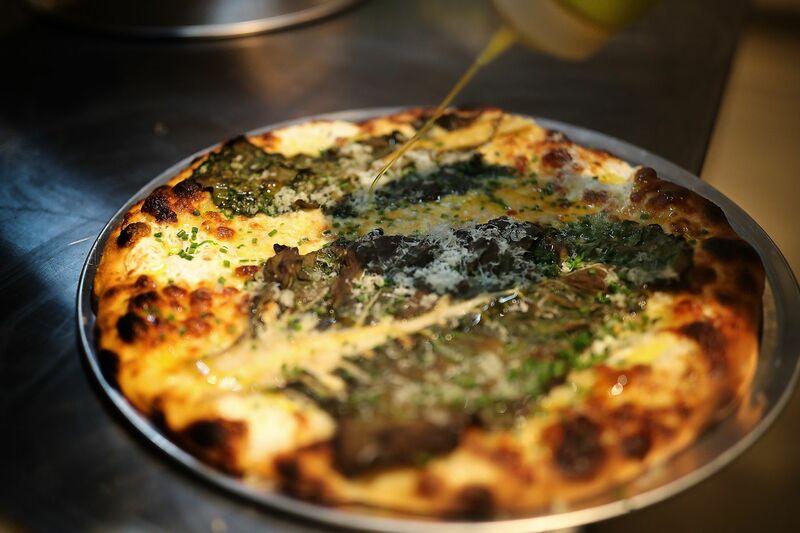 The Swiss chard pizza gets dressed with olive oil before being served at the new location of Pizzeria Beddia in Philadelphia. Where Joe Beddia goes, lines form. A year ago, pizza aficionados were positively beside themselves trying to snag one of the last pies from Beddia’s Montague deck oven before he closed his tiny, two-man shop on Girard Avenue in Fishtown in favor of an opening in larger quarters nearby. Lines formed six hours before the doors opened for the final weeks. Beddia landed a book deal and showed people how they, too, could make tasty pizza at home. Pizzeria Beddia — now set up about three blocks away on a back street beneath a sign with a neon peace symbol, with 80 indoor seats (more outdoor), a bar, and a full staff, including business partners (Greg Root, Nick Kennedy, and Al Lucas of the nearby Suraya) and a chef (Dan Britt) — might appear to be an easier nut to crack. Upon Beddia’s opening last week, the reservation book filled immediately for the next 60 days, unnerving those who might have to wait for the unspecified number of seats set aside for walk-ins. Get to 1313 N. Lee St. at the 5 p.m. daily opening, though, and the wait should be bearable. There is still no phone. Pizzeria Beddia 2.0, as people are calling it, is bright, cheery, and family- and Instagram-friendly, with roomy seating beneath whimsical light fixtures from a series created by the art duo known as FriendsWithYou called “Little Cloud." Joe Beddia (center) talks with customers inside the new location of Pizzeria Beddia. The menu includes only four pizzas (starting at $22) and a few antipastas, such as salads, cheese, and vegetables. Beddia said the pizza is the same as it was before, though baking is done in two Pizza Master three-deck ovens. The 20-seat bar has what Beddia calls “a simple beverage program”: wines, only two beers on draft, a kombucha, and three cocktails, plus soft-serve ice cream for dessert.